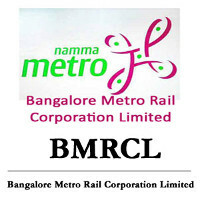 Bangalore Metro Rail Corporation - BMRC published an official notification for Recruitment of Engineer for 68 posts. Eligible candidates can apply for this recruitment. You can view more details about this recruitment including No. of posts, name of post, Educational qualification, Age limit, Selection process, How to apply etc... You can also view official notification and other important facts about this recruitment e.g. Important links and Important dates. Educational qualification & Experience: BE/B.Tech in Civil Engineering with 12 years experience for Executive Engineer, B.Tech/ BE in Civil with 5 years experience for AEE and BE/B.Tech in Engineering for Assistant Engineer. Address: General Manager (HR), Bangalore Metro Rail Corporation Limited, III Floor, BMTC Complex, K.H.Road, Shanthinagar, Bangalore 560027".